The CM Stacker is a new computer chassis from Cooler Master with extremely powerful functions. The innovative design supports Extend ATX, BTX and dual power supply, making for easy upgrading. The Cooler Master Stacker supports up to eight regular fans, giving it unmatched cooling performance. Built from 1.0 mm thick steel plate, the CM Stacker is immensely strong, with a high-quality anti-vibration stand providing extra protection for the system. Designed for maximum extensibility and allowing the user the utmost flexibility in the utilization of space, the Cooler Master Stacker makes upgrading incredibly easy, and can be configured to meet your own personal needs with minimum hassle. 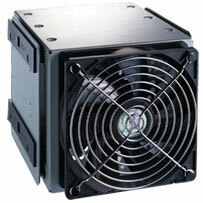 The cross flow fan is an option that can be added below which allows air to be blown directly on your main components. With its adjustable fan speed controller, the available four speeds will give you the ability to adjust the speed depending on noise level and airflow. This fan is made exclusively for use with the Stacker case and is a great addition to help keep you system running cool. The specifics for the fan are below. The STB-3T4-E1 4-in-3 Device Module is designed to convert three 5.25 inch bays into four 3.5 inch hard drive bays. It also offers an ideal cooling solution for the four hard drives it accommodates with a powerful 1200 RPM 120 mm fan that plugs into a standard four pin Molex connector. The module fits in any three consecutive open 5.25 inch bays, but comes preinstalled in the bottom most bays. The specifics for the STB-3T4-E1 are below, and additional STB-3T4-E1 4-in-3 Device Modules can be added below.